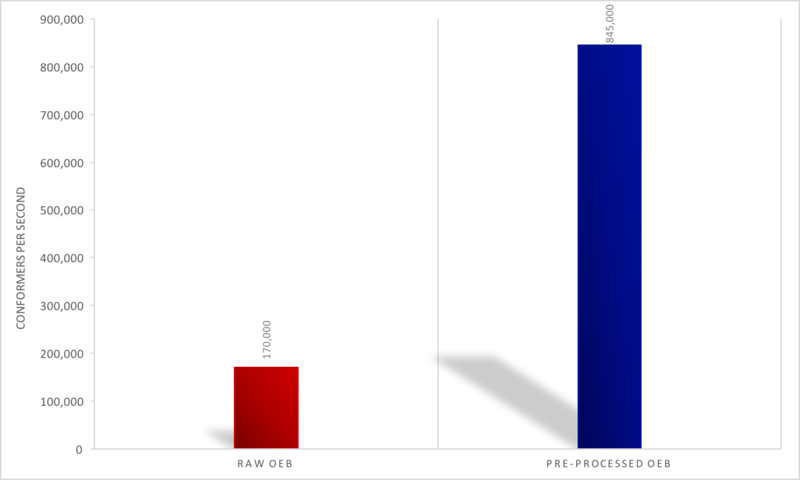 In this tutorial, you will learn how to pre-process a conformer database file for FastROCS TK, allowing for faster database load times with OEShapeDatabase.Open. Load times could be up to 10x faster. See the figure below for an eMolecules dataset of 14 million conformers. There is no need to Gzip which means faster OEMolDatabase.Open. Sets the energy of each conformer to 0.0 to avoid writing it to OEB. Suppresses hydrogens and reorders reference conformers for compression. Pre-calculates self-color and self-shape terms for all conformers. The color terms cached by OEPrepareFastROCSMol are from the OEColorFFType_ImplicitMillsDean color force field. A different color force field can be given as the second argument to override ImplicitMillsDean. In general, calling OEPrepareFastROCSMol and OEPRECompress will result in a smaller OEB file than the default OEB.GZ output from OMEGA. Further reduction in file-size can be achieved by using an OEMCMolType_HalfFloatCartesian molecule to store reference coordinates and torsions as 16-bit floating point.